As a full-service landscaping contractor serving Orange County, D F Landscape can help you achieve the look and functionality you want from your outdoor area. We can work with existing designs or help you create complete landscaping plans from scratch. With over 30 years of experience, we excel in everything from planting and irrigation to drought-resistant landscaping, outdoor lighting, and select hardscape projects. By offering our expert landscaping services at competitive prices with outstanding customer service, we have earned thousands of satisfied clients throughout Anaheim, Irvine, Dana Point, Laguna Niguel, and other Orange County communities, and an exceptionally high rate of referrals and return business. At D F Landscape, our hardscape services include fencing, installing wood patio covers, building retaining walls, putting in freestanding gazebos, and creating walkways and pathways using flagstone, natural bark, DG (decomposed granite), or walking stones/rocks (such as black Mexican beach pebbles, Arizona river stones, and more). We can also regrade an area to create a more natural landscape or incorporate an outdoor BBQ. In each case, we always work to recommend solutions that will help our clients reach their functional and aesthetic goals while staying within their specific budget constraints. 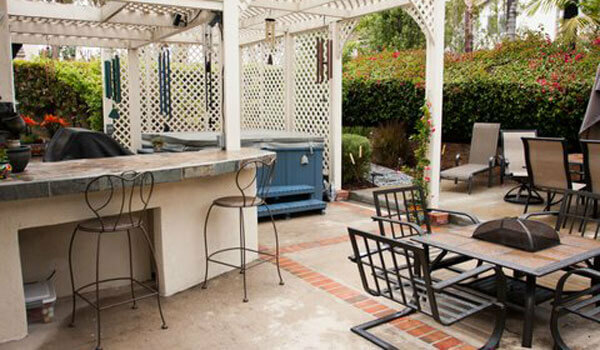 Our patio covers will enhance any Orange County backyard or patio. That's because we build each and every patio cover to exact customer specifications. During a comprehensive consultation, we will take the time to go over our many patio cover customization options, such as size, paints, corbels, designs (e.g. lattice, solid, or combination), and more, and provide recommendations to help you determine which patio cover style will best suit your property, needs, and budget. Our patio covers are all expertly crafted from high-quality wood and warrantied for one year. At D F Landscape, we can install low-voltage path lights, ground lights, well lights, and/or spotlights, with or without timers and dimmers, to help our Orange County clients achieve nearly any outdoor lighting effect at a great price. We install Unique Lighting Systems, which are backed by a limited lifetime warranty, and other brands such as Kichler, Vista, and Fx. Call us today for a free on-site consultation and service. These services can be included as part of a larger landscaping plan or contracted on a standalone basis. Throughout the years I have utilized DF Landscape to provide complete landscaping projects and maintenance services for houses and commercial properties. DF proposals have been cost competitive and selected the majority of times. The quality of workmanship is excellent completing work in a timely manner with attention to details. I have never hesitated to refer DF to others knowing that work . . .